Sea scallops are high in protein, low in both saturated fat and cholesterol and rich in nutrients like vitamin B-12 and selenium. They are also a good source of heart-healthy omega-3 fatty acids while containing little mercury contamination. According to "How to Cook Everything" author Mark Bittman, scallops can be more tender and flavorful than other types of shellfish as long as you choose scallops that haven't been treated with phosphate preservatives and are careful not to overcook them. Choose a defrosting method for frozen sea scallops that won't leave them partially cooked and rubbery. If you've planned ahead, The Cookingfishmonger says that the best way to defrost frozen sea scallops is to place them in the refrigerator overnight, or for approximately 24 hours. Take the scallops out of the package, put them in a large dish or bowl and cover the top with plastic wrap before leaving the seafood to thaw in the refrigerator. Make sure that your refrigerator temperature is set at or below 38 degrees Fahrenheit. When you're pressed for time and need to defrost frozen sea scallops as quickly as possible, the Better Homes and Gardens website says you can use the microwave, though you'll need to watch them closely to make sure you don't begin inadvertently cooking the scallops. 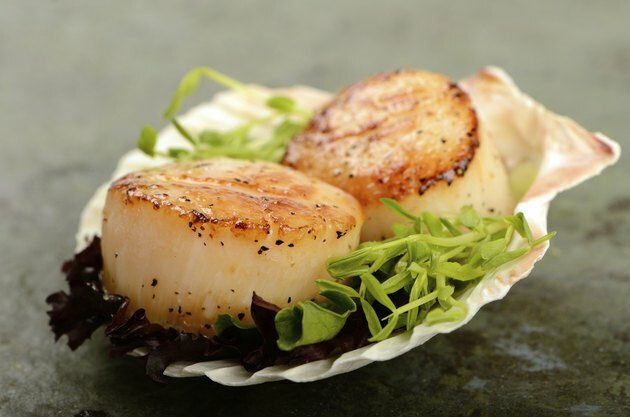 Put the scallops in a microwave-safe bowl or dish, cover them with a paper towel and set the microwave to the defrost setting, or 30 percent of the regular setting. After 30 seconds, remove the bowl and check the scallops. Defrost them for 30 additional seconds, if needed. The best method for defrosting frozen sea scallops that haven't been in the refrigerator overnight, but that you don't want to run the risk of ruining in the microwave, is to place them under cool running water. Do not allow the scallops to come into direct contact with the water. Instead, put the frozen shellfish into a resealable plastic bag, seal the bag securely and place it in a bowl that's under running tap water. Plan on 1 pound of frozen sea scallops requiring approximately 1/2 hour to defrost. Some types of frozen sea scallops should not be defrosted before cooking. For example, commercially available brands of breaded whole scallops are meant to be pan-fried or deep-fried directly from the freezer; the instructions on the packaging specify that the scallops should not be thawed ahead of time. Always follow the cooking instructions provided with your frozen sea scallops. If you have questions about how best to cook or defrost your particular brand, contact the manufacturer's customer service department for more information.